It's all about that new Baby-G hype! It got me wearing my favourite BA-110SN-7A (in matt white). I guess most of you are familiar with Baby-G;,it’s a lifestyle brand under Casio. Just G-SHOCK is more for guys, Baby-G is more suitable for ladies as they are designed for small wrists hehe. 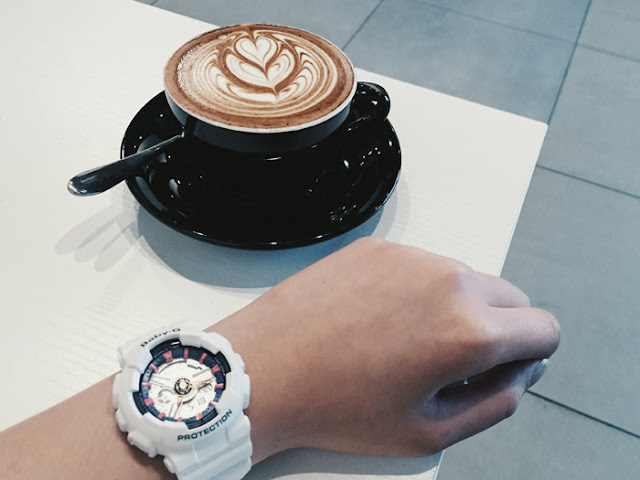 I find that the watch is not only rugged like G-SHOCK, but it also has different variations for different lifestyle. As you know, the trend now is all about being sporty.A pair of sneakers, casual tees, cotton shorts, or gym wear (even if you don’t gym!) and you’re all ready to go. Like me, I love wearing outfits like that! It’s so comfortable and I feel good about it. I've been picking up gym lately and I love how my Baby-G has become one of my daily essentials to keep things up with my jam-packed schedule. 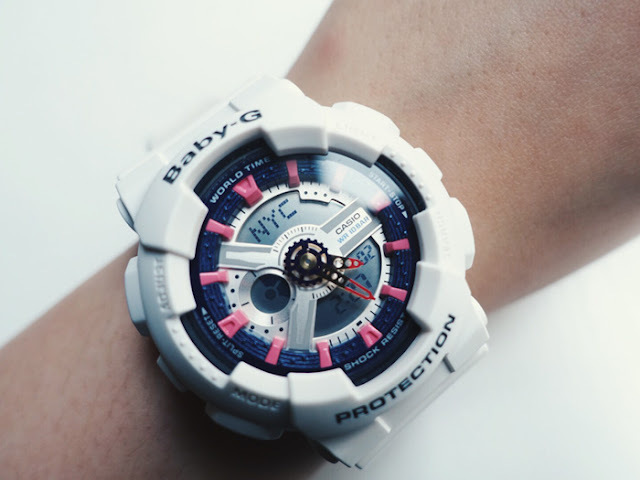 One of my fav features in Baby-G has is the World Time function, where we can set our time to different time zones! You don't have to keep re-setting the time as you travel to different countries. It shows you 29 time zones (48 cities + UTC), city code display, and daylight saving on/off. Like I mentioned earlier, I have been going to the gym recently and the alarm and countdown timer feature are super plus points to me. In every session of my workout, I set a certain time limit and challenge the number of reps I can do within the time frame. Not only it’s convenient to use, the Baby-G design is also fashionable and matches with my gym outfit. I guess I can get my Kendall Jenner body very soon (YES IM SERIOUS!) heh. Look forward to it! Nice post. Speaking about technologies. I found the ideals data room very convenient for my business. It keeps my data stored safely online. Awesome post. I like this.